My favorite part of the entire week is Sunday night at 6pm. It’s the time when my husband and I are together, catching up on our days happenings, pouring a glass of wine and synchronizing dinner. It is just the 2 of us (if you don’t count Hula, of course) and we still make it important, every single Sunday to enjoy a leisurely dinner together. I have to say that the real fun is in prepping the masterpiece. We usually have 2 courses (yes, just for the 2 of us). Either an antipasto platter filled with roasted vegetables and cheeses or a simple and bright caprese salad with tomatoes and basil. Italian cuisine is usually the feature every Sunday night as we unwind and prepare for the busy week ahead. We sip wine, cut vegetables. Sip more wine, snack on appetizers, sip more wine and laugh at corny jokes, sip more wine and finally attempt to start dinner. Thankfully with our designated roles in the kitchen, dinner magically finishes in the midst of belly laughs and wine pours. 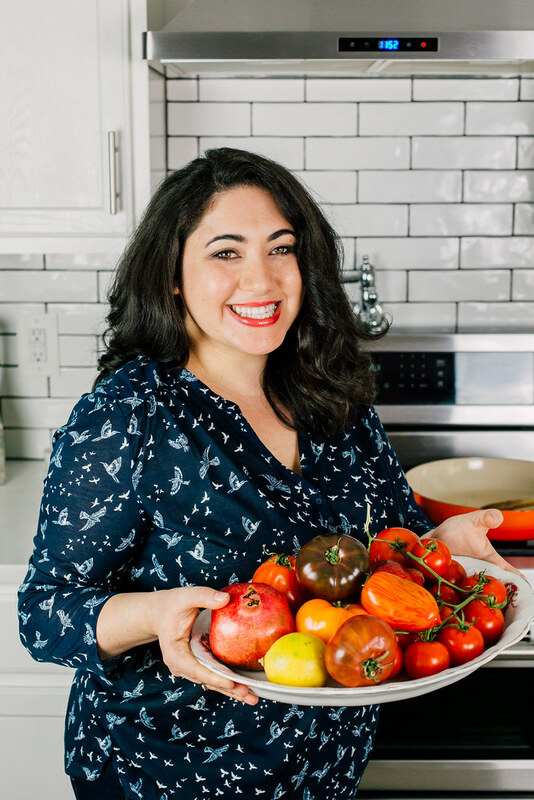 I’ve always had a connection to Italian food and even though I come from a Mediterranean background, Italian food always seemed so comforting and homey to me. Not only is it my favorite, but my mom’s also. 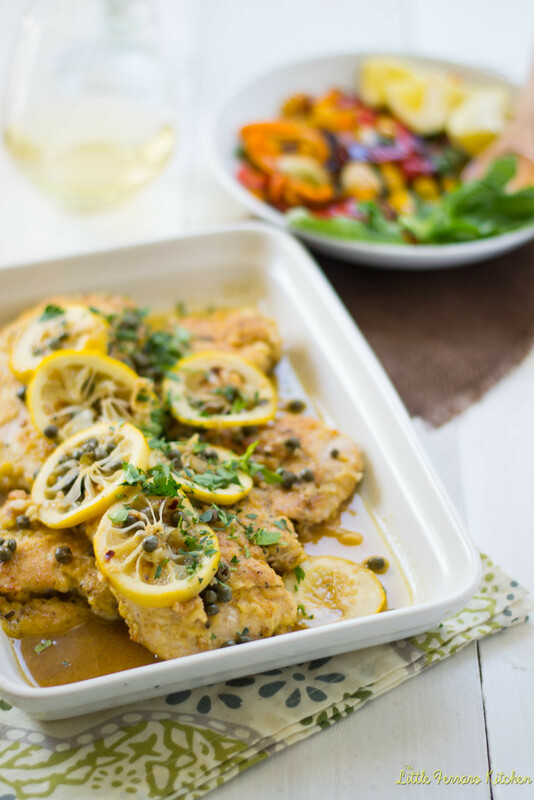 I have vivid memories of both my mom and I ordering the same chicken picatta dish every single time we would go to an Italian restaurant when I was a little girl in New York. 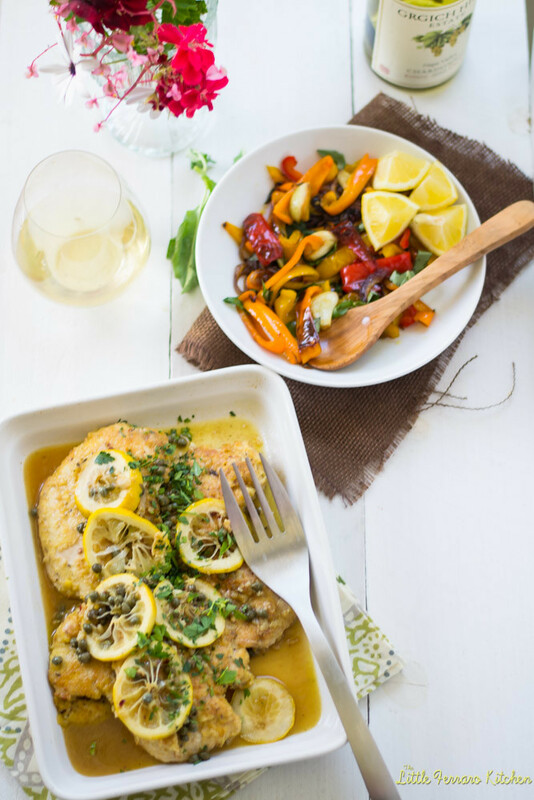 And now, years later as my mom lives in Hawaii and I in California, I have created my own chicken picatta recipe which is highly requested (at the Ferraro Kitchen, of course), every time we visit each other. The beautiful thing about chicken picatta is its simplicity. 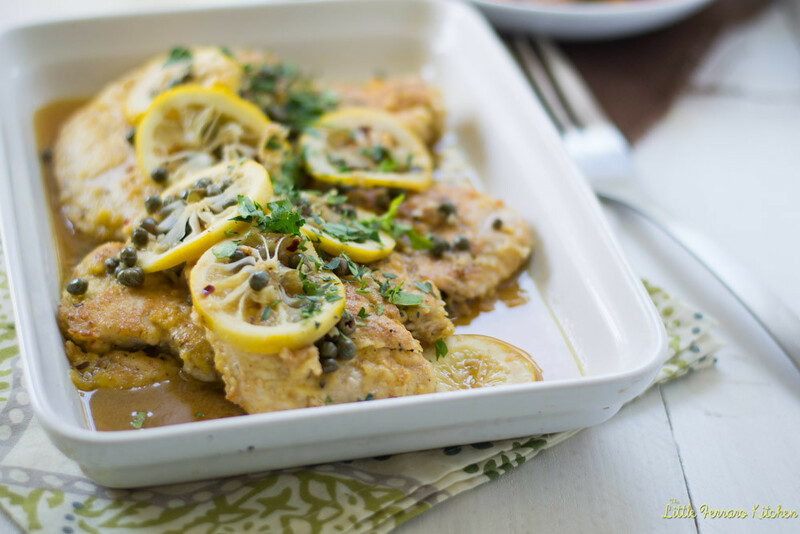 It is an easy dish really with a few humble ingredients, such as fresh lemon and capers. And with the help of some of my favorite McCormick spices. I have been able to jazz it up a bit and modernized my Italian favorite. Earthy oregano, garlic powder and a pinch of spicy cayenne is added to the chicken’s coating as a little twist on the classic. My mom always added garlic powder to her chicken dinners, which I thought was such a great idea. It doesn’t over-power the chicken, but gives the chicken picatta a nice light garlic background. I just helped punch up the flavor a bit more with a little heat from cayenne and dried oregano. it’s dinner nights like these that make me feel so blessed to have the wonderful family and memories that I have. Even though my family and I are in different parts of the world, I know that we cherish the same thoughts and feelings and that when we are able to be together under the same roof, we can all laugh happily with full bellies and smiles from ear to ear. So tell me, what is your favorite family recipe? For inspiration and recipe ideas, make sure to check out McCormick’s Flavor Print , which is a tool that provides recipes based on your flavor preferences. The more you use FlavorPrint, the more familiar it becomes with your tastes, and the better the recipes it will suggest. My flavor profile said I am savory with an emphasis on onion, tomato and cheese…I would say that is pretty accurate to me! Thanks to McCormick’s American Homemade Program for reminding me how wonderful family is and how truly blessed I am to be able to share homemade memories with others. Start by place chicken breasts between 2 pieces of plastic wrap. Using a meat hammer, pound on the breasts to about 1/4in thickness. Season chicken with salt and pepper on both sides and set aside. Next set up a dredging station. 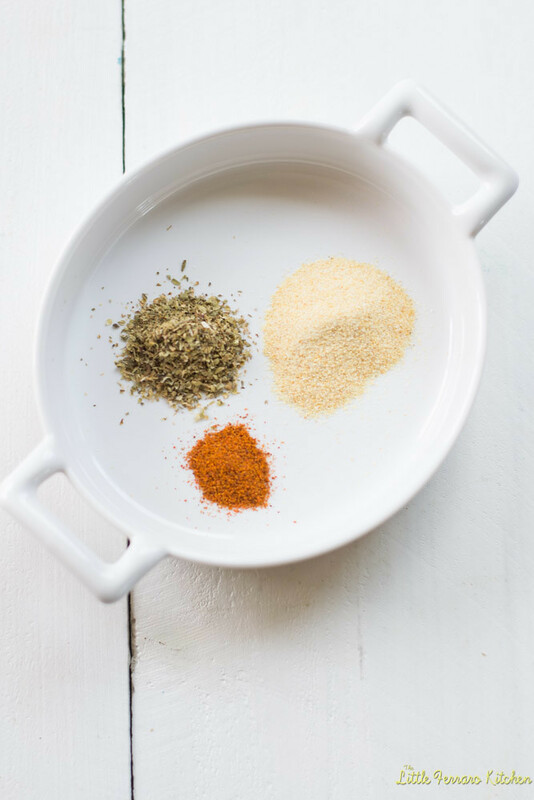 In a large shallow bowl, mix together the flour, cayenne, garlic powder and dried oregano. In another shallow bowl, whisk together the eggs and set aside. Using a pair of tongs, coat 1 chicken breast at a time in the flour until well coated and then dredge chicken into the egg mixture, allowing excess to drip off. Repeat with the rest of the chicken and set aside until pan is hot enough. Next, begin heating a large skillet with a good drizzle of olive oil on medium heat. Place chicken in skillet and cook on both sides until well browned, about 4 minutes per side. When chicken is done, remove to a plate and set aside. In the same skillet, heat caramelize the garlic and red pepper flakes for about 1-2 minutes. You may want to add additional oil if using. Add white wine, chicken stock, lemon slices and juice of ½ lemon. Continue to cook on medium-high heat while using a spatula to scrape the meaty bits from the bottom of the pan. The sauce should reduce slightly and become thicker. Season with salt and pepper. Next add back your chicken and add capers. Gently coat chicken in it’s sauce. Place chicken in a serving dish and pour sauce on top with lemon slices. Garnish with freshly chopped basil. Serve with your favorite pasta dish. This looks pretty and delicious! Bookmarking so that I can make it for my family dinner. Yayyyy Let me know when you do!! 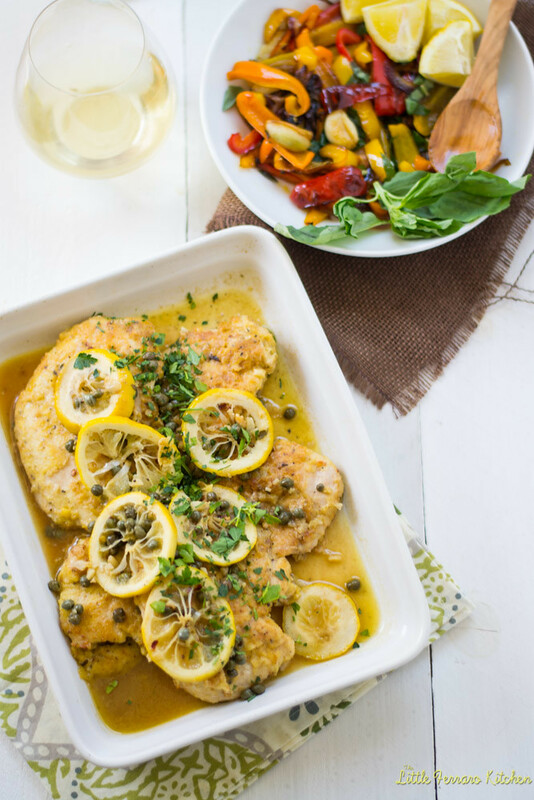 Your Chicken Picatta looks great! Great recipe! Made it without the capers since I forgot to pick some up at the store. Very yummy and close to my fathers recipe! I added a little flour to the sauce to thicken it up a bit and it was fantastic! Looking forward to trying your other recipes.